Quibbling over Oscar nominations is as futile as quibbling over who left the cap off the toothpaste. No matter what you say or how emphatically you protest, you know it’s going to happen again, so either give it up, or pack your things and get out. Fighting the tide isn’t just mundane, it’s exhausting. And now that we have ten Best Picture nominations instead of five, there are more uncapped toothpastes (and a few raised toilet seats) than ever before. An Education? District 9? What is this, The People’s Choice Awards? Perhaps. We all know the Academy Awards have ceased to be about The Academy or the Awards, let alone the movies themselves. Now, like everything else, like The Biggest Loser and Fear Factor, they’re about the numbers. Thus the ten: with more movies in the running, you have – or so the logic goes – more viewers. But there I go again with the toothpaste. And yet, like a spineless cuckold, I keep coming back. Call it ritual or call it cockeyed hope; call it an anthropological inquest or call it masochism, but there it is. I keep coming back. I’ve tried/am trying to make peace with the nauseating glory of it all. This morning, for instance, I hurried through the top portion of the nominees and scanned down to the bottom of the list. I saw there certain names that made my heart flutter. There was Inglourious Basterd‘s cinematographer, Robert Richardson; Anders Østergaard and Lise Lense-Møller, directors of the Oscar nominated documentary, Burma VJ; and miracle-workers Stephen Rivkin and John Refoua (and James Cameron), editors of Avatar. Seeing in print these formidable figures of the movies, whose TV presence has no bearing on ratings, and whose work should win them the boost of Oscar recognition, I felt again that feeling of wholesome movie-love only the Academy Awards could ignite. It was swell to see deserving people like Bigelow and Bridges on the list, but they were locks, and as widely recognized above-the-liners, they’ve already received their chunk of national attention. But it’s an entirely different opportunity for Jesse Armstrong, Simon Blackwell, Armando Iannucci, and Tony Roche, who have been nominated for their In the Loop screenplay. Moment to moment, and line to line, here was a script that never quit, a script so ornately verbal, and so in love with language, that watching the movie, it was difficult not to imagine its writers hunched over a dozen volumes of the OED, debating every word down to its every syllable. And I do mean syllable: rhythmically, In the Loop is an astounding, almost musical feat of film comedy – one of the best in quite a while – and to see the picture gain Oscar visibility, even if it doesn’t go on to win, felt like some kind of personal vindication. In the midst of an undertaking that invites so much cynicism, these names (and many others) are a reminder of why we care so much in the first place. So hold your heads high, Oscar lovers, because where careers are made, lives can change. And that has nothing to do with toothpaste. By now, I’m sure people of all sexes have had a good, long look at yesterday’s Dargis. To those who haven’t: Manohla Dargis, The New York Times’ great and worthy defender of great and worthy movies, and one of today’s cleverest and most erudite critics, has let crack her mighty whip on the back of, with all due respect, the wrong adversary. The usual line on Hollywood [she writes] is that it cares only about box office, which is at once true and something of a convenient excuse. Money makes the movie world go round, sure. But there are exceptions to this perceived rule, as some of my favorite male directors, including Michael Mann, have routinely proved with various box office disappointments. Released in 2001, Mr. Mann’s “Ali,” a well-regarded if not universally beloved biography of Muhammad Ali with Will Smith, brought in nearly $88 million in global receipts. (The production budget, partly paid for by Sony, was an estimated $107 million.) The next year Ms. [Kathryn] Bigelow’s independently financed “K-19: The Widowmaker,” a submarine adventure movie with Harrison Ford, was released to solid reviews, raking in just under $66 million globally (with a $100 million production budget). While it is true that Hollywood could benefit from more women behind the camera, the dearth of female directors has less to do with women and men, as she attests, and more to do with grosses and opening weekends. The reasons Michael Mann continued to get deals despite Ali’s $22 million deficit are less reductive, and, I’m happy to say, less mysterious (or insidious) than Dargis would have it. First of all, Mann, unlike Bigelow, had a recent history of hits at the time of Ali’s commercial disappointment. The Last of the Mohicans (1992), Heat (1995), and The Insider (1999) were all either reasonably or substantially successful at the box office, whereas Bigelow’s recent record, which included The Weight of Water (2000) and Strange Days (1995), would not have helped her much when the time came to get a movie made post K-19. What would she have argued in her defense? If the studios wanted a return in their investment, Michael Mann had – and continues to have – a much better case. Also, it should be said that, his filmography aside, Michael Mann had Tom Cruise (in Collateral) and Jamie Foxx (in Miami Vice), and to an ambivalent executive unsure of the director’s immediate bankability, their names were surely a comfort. If, in the years following K-19, Kathryn Bigelow had managed to interest stars of Cruise and Foxx’s caliber in her projects, she would have unquestionably gotten the kind of studio attention Mann got in his. And with names like that attached, if one pig-headed executive turned her down, another would have snapped her right up. Of course, it could be asserted that Bigelow didn’t get stars because of a longstanding stigma against women filmmakers. Maybe. But I don’t see Angelina Jolie or Meryl Streep turning down Bigelow for that reason. Nor do I see executives denying a financially solid entity the opportunity return the investment once more. The days of producers making calls based upon personal predilections – be they constructive or prejudicial, artistic or sexist – are, alas, over. The proof is in the pictures: studio executives don’t have jobs because they get to make the movies they want to make or because they can reject the movies (and/or the filmmakers) they want to reject; they have jobs because they know what pimply teenage boys want to see at 7:30 on a Friday night. How do they know? The receipts tell them so. And if Kathryn Bigelow had those receipts in her favor, she’d be getting all deals in the world. So why couldn’t I let this one fly? Why couldn’t I – as my girlfriend advised me – not make this my first-ever blog entry, but wait until I had a few more posts under my belt before I dipped into such problematic waters? Because Dargis, I’m afraid, is fighting the right fight the wrong way. We don’t need more female directors in Hollywood, we need more female directors outside of Hollywood, where voice matters, and where, beyond the flattening forces of big-budget filmmaking, it actually stands a chance of being a) heard by the public and then b) inculcated into the Hollywood system. That’s how Bigelow did it. 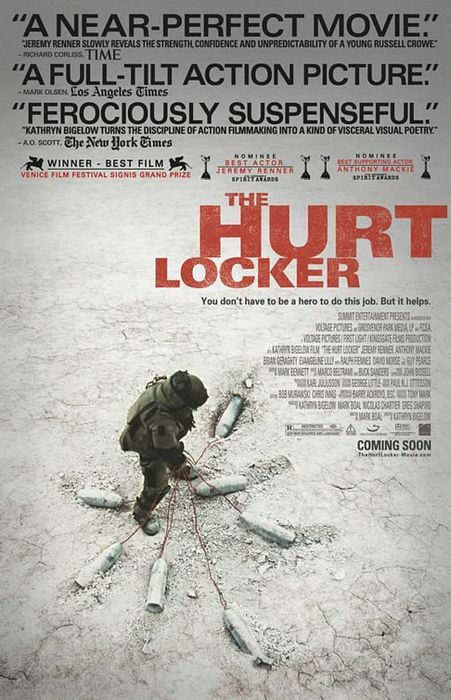 As Dargis points out, she financed her latest film, The Hurt Locker, with French money, and now it’s a lead forerunner in the incumbent Oscar race. That’s why her next film, Triple Frontier, has been set up at Paramount. You see? Hollywood doesn’t play favorites. It’s just a gigolo trying to make its rent.